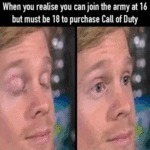 When You Realise You Can Join The Army At 16 But..
Oh Boy! Sugar Frosted Airballs! Midnight Dreary It Was. Pondered Did I.